"Pushkin" redirects here. For other uses, see Pushkin (disambiguation). Alexander Sergeyevich Pushkin (English: /ˈpʊʃkɪn/; Russian: Александр Сергеевич Пушкин[note 1], tr. Aleksándr Sergéyevich Púshkin, IPA: [ɐlʲɪˈksandr sʲɪrˈɡʲe(j)ɪvʲɪtɕ ˈpuʂkʲɪn] ( listen); 6 June [O.S. 26 May] 1799 – 10 February [O.S. 29 January] 1837) was a Russian poet, playwright, and novelist of the Romantic era who is considered by many to be the greatest Russian poet and the founder of modern Russian literature. Pushkin was born into Russian nobility in Moscow. His father, Sergey Lvovich Pushkin, belonged to Pushkin noble families. A maternal great-grandfather was African-born general Abram Petrovich Gannibal. He published his first poem at the age of 15, and was widely recognized by the literary establishment by the time of his graduation from the Tsarskoye Selo Lyceum. Upon graduation from the Lycee, Pushkin recited his controversial poem "Ode to Liberty", one of several that led to his being exiled by Tsar Alexander the First. While under the strict surveillance of the Tsar's political police and unable to publish, Pushkin wrote his most famous play, the drama Boris Godunov. His novel in verse, Eugene Onegin, was serialized between 1825 and 1832. Pushkin was fatally wounded in a duel with his brother-in-law, Georges-Charles de Heeckeren d'Anthès, also known as Dantes-Gekkern, a French officer serving with the Chevalier Guard Regiment, who attempted to seduce the poet's wife, Natalia Pushkina. Pushkin's father, Sergei Lvovich Pushkin (1767–1848), was descended from a distinguished family of the Russian nobility that traced its ancestry back to the 12th century. Pushkin's mother, Nadezhda (Nadya) Ossipovna Gannibal (1775–1836), was descended through her paternal grandmother from German and Scandinavian nobility. She was the daughter of Ossip Abramovich Gannibal (1744–1807) and his wife, Maria Alekseyevna Pushkina (1745–1818). Ossip Abramovich Gannibal's father, Pushkin's great-grandfather, was Abram Petrovich Gannibal (1696–1781), an African page kidnapped to Constantinople as a gift to the Ottoman Sultan and later transferred to Russia as a gift for Peter the Great. Abram wrote in a letter to Empress Elizabeth, Peter the Great's daughter, that Gannibal was from the town of "Lagon". Largely on the basis of a mythical biography by Gannibal's son-in-law Rotkirkh, some historians concluded from this that Gannibal was born in a part of what was then the Abyssinian Empire, located today in Eritrea. Vladimir Nabokov, when researching Eugene Onegin, cast serious doubt on this origin theory. Later research by the scholars Dieudonné Gnammankou and Hugh Barnes eventually conclusively established that Gannibal was instead born in Central Africa, in an area bordering Lake Chad in modern-day Cameroon. After education in France as a military engineer, Gannibal became governor of Reval and eventually Général en Chef (the third most senior army rank) in charge of the building of sea forts and canals in Russia. Born in Moscow, Pushkin was entrusted to nursemaids and French tutors, and mostly spoke French until the age of ten. He became acquainted with the Russian language through communication with household serfs and his nanny, Arina Rodionovna, whom he loved dearly and was more attached to than to his own mother. He published his first poem at 15. When he finished school, as part of the first graduating class of the prestigious Imperial Lyceum in Tsarskoye Selo, near Saint Petersburg, his talent was already widely recognized within the Russian literary scene. After school, Pushkin plunged into the vibrant and raucous intellectual youth culture of the capital, Saint Petersburg. In 1820, he published his first long poem, Ruslan and Ludmila, with much controversy about its subject and style. While at the Lyceum, Pushkin was heavily influenced by the Kantian liberal individualist teachings of Alexander Petrovich Kunitsyn, whom Pushkin would later commemorate in his poem 19 October. Pushkin also immersed himself in the thought of the French Enlightenment, to which he would remain permanently indebted throughout his life, particularly Diderot and Voltaire, whom he described as "the first to follow the new road, and to bring the lamp of philosophy into the dark archives of history." Pushkin gradually became committed to social reform and emerged as a spokesman for literary radicals. That angered the government and led to his transfer from the capital in May 1820. He went to the Caucasus and to Crimea and then to Kamianka and Chișinău in Moldavia, where he became a Freemason. He joined the Filiki Eteria, a secret organization whose purpose was to overthrow Ottoman rule in Greece and establish an independent Greek state. He was inspired by the Greek Revolution and when the war against the Ottoman Turks broke out, he kept a diary recording the events of the national uprising. He stayed in Chișinău until 1823 and wrote two Romantic poems, which brought him acclaim: The Captive of the Caucasus and The Fountain of Bakhchisaray. In 1823, Pushkin moved to Odessa, where he again clashed with the government, which sent him into exile on his mother's rural estate of Mikhailovskoye (near Pskov) from 1824 to 1826. In Mikhaylovskoye, Pushkin wrote nostalgic love poems which he dedicated to Elizaveta Vorontsova, wife of Malorossia's General-Governor. Then Pushkin continued work on his verse-novel Eugene Onegin. In Mikhaylovskoye, in 1825, Pushkin wrote the poem To***. It is generally believed that he dedicated this poem to Anna Kern, but there are other opinions. Poet Mikhail Dudin believed that the poem was dedicated to the serf Olga Kalashnikova. Pushkinist Kira Victorova believed that the poem was dedicated to the Empress Elizaveta Alekseyevna. Vadim Nikolayev argued that the idea about the Empress was marginal and refused to discuss it, while trying to prove that poem had been dedicated to Tatyana Larina, the heroine of Eugene Onegin. Authorities summoned Pushkin to Moscow after his poem "Ode to Liberty" was found among the belongings of the rebels from the Decembrist Uprising (1825). Being exiled in 1820, Pushkin's friends and family continually petitioned for his release, sending letters and meeting with Tsar Alexander I and then Tsar Nicholas I on the heels of the Decembrist Uprising. Upon meeting with Tsar Nicholas I Pushkin obtained his release from exile and began to work as the tsar's Titular Counsel of the National Archives. However, because insurgents in the Decembrist Uprising (1825) in Saint Petersburg had kept some of Pushkin's earlier political poems the tsar retained strict control of everything Pushkin published and he was unable to travel at will. During that same year (1825), Pushkin also wrote what would become his most famous play, the drama Boris Godunov, while at his mother's estate. He could not however, gain permission to publish it until five years later. The original and uncensored version of the drama was not staged until 2007. Around 1825–1829 he met and befriended the Polish poet Adam Mickiewicz, during exile in central Russia. In 1829 he travelled through the Caucasus to Erzurum to visit friends fighting in the Russian army during the Russo-Turkish War. In the end of 1829 Pushkin wanted to set off on a journey abroad, the desire reflected in his poem Поедем, я готов; куда бы вы, друзья... He applied for permission for the journey, but received negative response from Nicholas I on 17 January 1830. Around 1828, Pushkin met Natalia Goncharova, then 16 years old and one of the most talked-about beauties of Moscow. After much hesitation, Natalia accepted a proposal of marriage from Pushkin in April 1830, but not before she received assurances that the Tsarist government had no intentions to persecute the libertarian poet. Later, Pushkin and his wife became regulars of court society. They officially became engaged on 6 May 1830, and sent out wedding invitations. Due to an outbreak of cholera and other circumstances, the wedding was delayed for a year. The ceremony took place on 18 February 1831 (Old Style) in the Great Ascension Church on Bolshaya Nikitskaya Street in Moscow. When the Tsar gave Pushkin the lowest court title; Gentleman of the Chamber, the poet became enraged, feeling that the Tsar intended to humiliate him by implying that Pushkin was being admitted to court not on his own merits but solely so that his wife, who had many admirers including the Tsar himself, could properly attend court balls. In the year 1831, during the period of Pushkin's growing literary influence, he met one of Russia's other great early writers, Nikolai Gogol. After reading Gogol's 1831–1832 volume of short stories Evenings on a Farm Near Dikanka, Pushkin supported him and would feature some of Gogol's most famous short stories in the magazine The Contemporary, which he founded in 1836. By the autumn of 1836, Pushkin was falling into greater and greater debt and faced scandalous rumours that his wife had a love affair. On 4 November he sent a challenge to a duel for Georges d'Anthès (Dantes-Gekkern). Jacob van Heeckeren, d'Anthès' adoptive father, asked the duel be delayed by two weeks. With efforts by the poet's friends, the duel was cancelled. On 17 November Georges d'Anthès made a proposal to Natalia Goncharova's (Pushkina's) sister – Ekaterina Goncharova. The same day Pushkin sent the letter to refuse the duel. The marriage didn't resolve the conflict. Georges d'Anthès continued to pursue Natalia Goncharova in public. Rumours that Georges married Natalia's sister just to save her reputation started to spread. On 26 January (7 February) of 1837 Pushkin sent a "highly insulting letter" to Heeckeren. The only answer for that letter could be a challenge to a duel, and Pushkin knew it. Pushkin received the formal challenge to a duel through his sister-in-law, Ekaterina Gekkerna, approved by d'Anthès, on the same day through the attaché of the French Embassy Viscount d'Archiac. Since Dantes-Gekkern was the ambassador of a foreign country, he could not fight a duel – it would mean the immediate collapse of his career. The duel with d'Anthès took place on 27 January at the Black River. Pushkin was critically wounded, the bullet entering at his hip and penetrating into his abdomen. Two days later, on 29 January (10 February) at 14:45 Pushkin died of peritonitis. By Pushkin's wife's request he was put in the coffin in evening dress – not in chamber-cadet uniform, the uniform provided by the tsar. The funeral service was assigned to the St. Isaac's Cathedral, but it was moved to Konyushennaya church. The ceremony took place at a large gathering of people. After the funeral, the coffin was lowered into the basement, where it stayed until 3 February, before the departure to Pskov. Alexander Pushkin was buried on the territory of the monastery Svyatogorsk Pskov province beside his mother. His last home is now a museum. 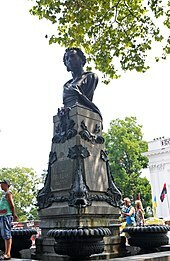 Pushkin had four children from his marriage to Natalia: Maria (b. 1832), Alexander (b. 1833), Grigory (b. 1835) and Natalia (b. 1836), the last of whom married morganatically with Prince Nikolaus Wilhelm of Nassau (of the House of Nassau-Weilburg) and was granted the title of Countess of Merenberg. Only the lines of Alexander and Natalia still remain. Natalia's granddaughter, Nadejda, married into the extended British royal family (her husband was the uncle of Prince Philip, Duke of Edinburgh). Descendants of the poet now live around the globe in the United Kingdom, the Czech Republic, Germany, Belgium and the United States. Critics consider many of his works masterpieces, such as the poem The Bronze Horseman and the drama The Stone Guest, a tale of the fall of Don Juan. His poetic short drama Mozart and Salieri (like The Stone Guest, one of the so-called four Little Tragedies, a collective characterization by Pushkin himself in 1830 letter to Pyotr Pletnyov) was the inspiration for Peter Shaffer's Amadeus as well as providing the libretto (almost verbatim) to Rimsky-Korsakov's opera Mozart and Salieri. Pushkin is also known for his short stories. In particular his cycle The Tales of the Late Ivan Petrovich Belkin, including "The Shot", were well received. Pushkin himself preferred his verse novel Eugene Onegin, which he wrote over the course of his life and which, starting a tradition of great Russian novels, follows a few central characters but varies widely in tone and focus. Onegin is a work of such complexity that, while only about a hundred pages long, translator Vladimir Nabokov needed two full volumes of material to fully render its meaning in English. Because of this difficulty in translation, Pushkin's verse remains largely unknown to English readers. Even so, Pushkin has profoundly influenced western writers like Henry James. Pushkin wrote The Queen of Spades, which is included in Black Water, a collection of short stories of a fantastic nature by major writers, compiled by Alberto Manguel. Pushkin's works also provided fertile ground for Russian composers. Glinka's Ruslan and Lyudmila is the earliest important Pushkin-inspired opera, and a landmark in the tradition of Russian music. Tchaikovsky's operas Eugene Onegin (1879) and The Queen of Spades (La Dame de Pique, 1890) became perhaps better known outside of Russia than Pushkin's own works of the same name. Mussorgsky's monumental Boris Godunov (two versions, 1868–9 and 1871–2) ranks as one of the very finest and most original of Russian operas. Other Russian operas based on Pushkin include Dargomyzhsky's Rusalka and The Stone Guest; Rimsky-Korsakov's Mozart and Salieri, Tale of Tsar Saltan, and The Golden Cockerel; Cui's Prisoner of the Caucasus, Feast in Time of Plague, and The Captain's Daughter; Tchaikovsky's Mazeppa; Rachmaninoff's one-act operas Aleko (based on The Gypsies) and The Miserly Knight; Stravinsky's Mavra, and Nápravník's Dubrovsky. Additionally, ballets and cantatas, as well as innumerable songs, have been set to Pushkin's verse (including even his French-language poems, in Isabelle Aboulker's song cycle "Caprice étrange"). Suppé, Leoncavallo and Malipiero have also based operas on his works. The Desire of Glory, which has been dedicated to Elizaveta Vorontsova, was set to music by David Tukhmanov (Vitold Petrovsky – The Desire of Glory on YouTube), as well as Keep Me, Mine Talisman – by Alexander Barykin (Alexander Barykin – Keep Me, Mine Talisman on YouTube) and later by Tukhmanov. Pushkin is considered by many to be the central representative of Romanticism in Russian literature although he was not unequivocally known as a Romantic. Russian critics have traditionally argued that his works represent a path from Neoclassicism through Romanticism to Realism. An alternative assessment suggests that "he had an ability to entertain contrarities which may seem Romantic in origin, but are ultimately subversive of all fixed points of view, all single outlooks, including the Romantic" and that "he is simultaneously Romantic and not Romantic". Stylized popular speech by making a salad of the famous three styles (low, medium elevation, high) dear to the pseudoclassical archaists and adding the ingredients of Russian romanticists with a pinch of parody. Pushkin is usually credited with developing Russian literature. He is seen as having originated the highly-nuanced level of language which characterizes Russian literature after him, and he is also credited with substantially augmenting the Russian lexicon. Whenever he found gaps in the Russian vocabulary, he devised calques. His rich vocabulary and highly-sensitive style are the foundation for modern Russian literature. His accomplishments set new records for development of the Russian language and culture. He became the father of Russian literature in the 19th century, marking the highest achievements of the 18th century and the beginning of literary process of the 19th century. He introduced Russia to all the European literary genres as well as a great number of West European writers. He brought natural speech and foreign influences to create modern poetic Russian. Though his life was brief, he left examples of nearly every literary genre of his day: lyric poetry, narrative poetry, the novel, the short story, the drama, the critical essay and even the personal letter. His work as a critic and as a journalist marked the birth of Russian magazine culture which included him devising and contributing heavily to one of the most influential literary magazines of the 19th century, the Sovremennik (The Contemporary, or Современник). Pushkin inspired the folk tales and genre pieces of other authors: Leskov, Yesenin and Gorky. His use of Russian language formed the basis of the style of novelists Ivan Turgenev, Ivan Goncharov and Leo Tolstoy, as well as that of subsequent lyric poets such as Mikhail Lermontov. Pushkin was analysed by Nikolai Gogol, his successor and pupil, and the great Russian critic Vissarion Belinsky. The last mentioned also produced the fullest and deepest critical study of Pushkin's work, which still retains much of its relevance. In 1929, Soviet writer, Leonid Grossman, published a novel, The d'Archiac Papers, telling the story of Pushkin's death from the perspective of a French diplomat, being a participant and a witness of the fatal duel. The book describes him as a liberal and a victim of the Tsarist regime. In Poland the book was published under the title Death of the Poet. In 1937, the town of Tsarskoye Selo was renamed Pushkin in his honour. There are several museums in Russia dedicated to Pushkin, including two in Moscow, one in Saint Petersburg, and a large complex in Mikhaylovskoye. Pushkin's death was portrayed in the 2006 biographical film Pushkin: The Last Duel. The film was directed by Natalya Bondarchuk. Pushkin was portrayed on screen by Sergei Bezrukov. The Pushkin Trust was established in 1987 by the Duchess of Abercorn to commemorate the creative legacy and spirit of her ancestor and to release the creativity and imagination of the children of Ireland by providing them with opportunities to communicate their thoughts, feelings and experiences. A minor planet, 2208 Pushkin, discovered in 1977 by Soviet astronomer Nikolai Chernykh, is named after him. A crater on Mercury is also named in his honour. MS Aleksandr Pushkin, second ship of the Russian Ivan Franko class (also referred to as "poet" or "writer" class). A station of Tashkent metro was named in his honour. The Pushkin Hills and Pushkin Lake were named in his honour in Ben Nevis Township, Cochrane District, in Ontario, Canada. 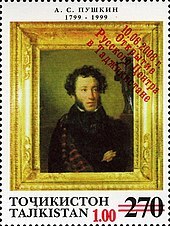 UN Russian Language Day, established by the United Nations in 2010 and celebrated each year on 6 June, was scheduled to coincide with Pushkin's birthday. A statue of Pushkin was unveiled inside the Mehan Garden in Manila, Philippines to commemorate the Philippines–Russia relations in 2010. The Alexander Pushkin diamond, the second largest found in Russia and the former territory of the USSR, was named after him. On 28 November 2009, a Pushkin Monument was erected in Asmara, capital of Eritrea. Pushkin statue in St. Petersburg, Russia. ^ In Pushkin's day, his name was written Александръ Сергѣевичъ Пушкинъ. ^ "Pushkin". Random House Webster's Unabridged Dictionary. ^ a b Basker, Michael. Pushkin and Romanticism. In Ferber, Michael, ed., A Companion to European Romanticism. Oxford: Blackwell, 2005. ^ Short biography from University of Virginia. Retrieved 24 November 2006. ^ Allan Reid, "Russia's Greatest Poet/Scoundrel". Retrieved 2 September 2006. ^ "Pushkin fever sweeps Russia". BBC News, 5 June 1999. Retrieved 1 September 2006. ^ "Biographer wins rich book price". BBC News, 10 June 2003. Retrieved 1 September 2006. ^ "Alexander Sergeevich Pushkin - Russian famous poet. Biography and interesting facts about his life". ^ "Aleksander Sergeevich Pushkin's descendants at". Genealogics.org. Archived from the original on 24 September 2015. Retrieved 2 March 2010. ^ Н.К. Телетова [N.K. Teletova] (2007). ^ Лихауг [Lihaug], Э.Г. [E.G.] (November 2006). "Предки А.С. Пушкина в Германии и Скандинавии: происхождение Христины Регины Шёберг (Ганнибал) от Клауса фон Грабо из Грабо [Ancestors of A.S. Pushkin in Germany and Scandinavia: Descent of Christina Regina Siöberg (Hannibal) from Claus von Grabow zu Grabow]". Генеалогический вестник [Genealogical Herald].–Санкт-Петербург [Saint Petersburg]. 27: 31–38. ^ Lihaug, Elin Galtung (2007). "Aus Brandenburg nach Skandinavien, dem Baltikum und Rußland. Eine Abstammungslinie von Claus von Grabow bis Alexander Sergejewitsch Puschkin 1581–1837". Archiv für Familiengeschichtsforschung. 11: 32–46. ^ a b New Statesman. New Statesman Limited. 2005. p. 36. Retrieved 7 January 2015. ^ Kahn, Andrew (2008). Pushkin's Lyric Intelligence. OUP Oxford. p. 283. ^ Pushkin, Alexander (1967). The Letters of Alexander Pushkin. University of Wisconsin Press. p. 164. ^ a b "Aleksandr Pushkin – Russiapedia Literature Prominent Russians". Russia: RT. ^ Images of Pushkin in the works of the black "pilgrims". Ahern, Kathleen M. The Mississippi Quarterly p. 75(11) Vol. 55 No. 1 ISSN 0026-637X. 22 December 2001. ^ (in Russian) P.K. Guber. Don Juan List of A. S. Pushkin. Petrograd, 1923 (reprinted in Kharkiv, 1993). pp. 78, 90–99. ^ Wilson, Reuel K. (1974). Pushkin's Journey to Erzurum. Springer. ISBN 978-90-247-1558-9. ^ Pushkin, A.S. (1974). Sobranie sochinenii. Vol. 2. Moscow: Khudozhestvennaya Literatura. p. 581. ^ Anderson, Nancy K. (trans. & ed.) (2000). The Little Tragedies by Alexander Pushkin. New Haven: Yale University Press. pp. 1 & 213 n.1. ISBN 0300080255. .
^ Joseph S. O'Leary, ”Pushkin in 'The Aspern Papers'”. The Henry James E-Journal Number 2, March 2000. Retrieved 24 November 2006. ^ Taruskin R. Pushkin in The New Grove Dictionary of Opera. London & New York, Macmillan, 1997. ^ Vladimir Nabokov, Verses and Versions, p. 72. ^ Schmadel, Lutz D. (2003). Dictionary of Minor Planet Names (5th ed.). New York: Springer Verlag. p. 179. ISBN 3-540-00238-3. ^ "Pushkin Hills". Geographical Names Data Base. Natural Resources Canada. Retrieved 25 May 2014. ^ "Pushkin Lake". Geographical Names Data Base. Natural Resources Canada. Retrieved 25 May 2014. ^ Wagner, Ashley (6 June 2013). "Celebrating Russian Language Day". Oxford Dictionaries. Retrieved 30 December 2013. ^ Alexander Pushkin (1799–1837). Plaque on the pedestal of Pushkin's statue at the Mehan Garden, Manila. Archived from the original on 27 September 2015. ^ (in Russian) "В Эритрее появится памятник Пушкину". Vesti. 26 November 2009. Retrieved 23 April 2017. Jakowlew, Valentin. "Pushkin's Farewell Dinner in Paris" (Text in Russian) Koblenz (Germany): Fölbach, 2006, ISBN 3-934795-38-2. Galgano Andrea (2014). The affective dynamics in the work and thought of Alexandr Pushkin, Conference Proceedings, 17th World Congress of the World Association for Dynamic Psychiatry. Multidisciplinary Approach to and Treatment of Mental Disorders: Myth or Reality?, St. Petersburg, 14–17 May 2014, In Dynamische Psychiatrie. Internationale Zeitschrift für Psychotherapie, Psychoanalyse und Psychiatrie – International Journal for Psychoanalysis, Psychotherapy, and Psychiatry, Berlin: Pinel Verlag GmbH, 1–3, Nr. 266–68, 2015, pp. 176–91.